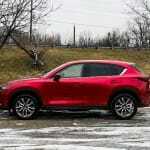 Since its debut back in 2013, the Mazda CX-5 has quickly become one of the leaders in the compact crossover segment and has become Mazda Canada’s bread and butter for revenue generation. 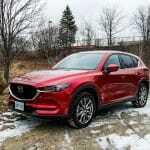 For 2018, one of every three Mazdas sold in Canada was a CX-5. 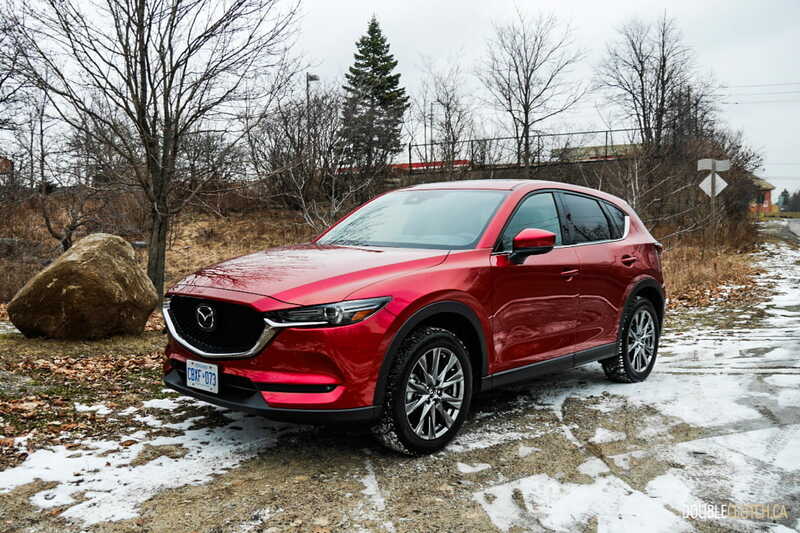 The CX-5 and Mazda3 made up over 72% of Mazda Canada’s sales in 2018, so naturally they both receive the company’s utmost attention when it comes to product planning and marketing strategy. With the Mazda3 receiving a brand-new redesign this year 2019, Mazda made sure the CX-5 is not left behind and gave it some serious upgrades to ensure it stays relevant until the next generation is launched. For 2019, the Mazda CX-5 adds a new, top of the line, Signature trim level, and equips it with a dedicated SKYACTIVE-G 2.5T turbocharged engine, producing 250 horsepower at 5,000RPM and 310 lb-ft. of torque at 2,000RPM. 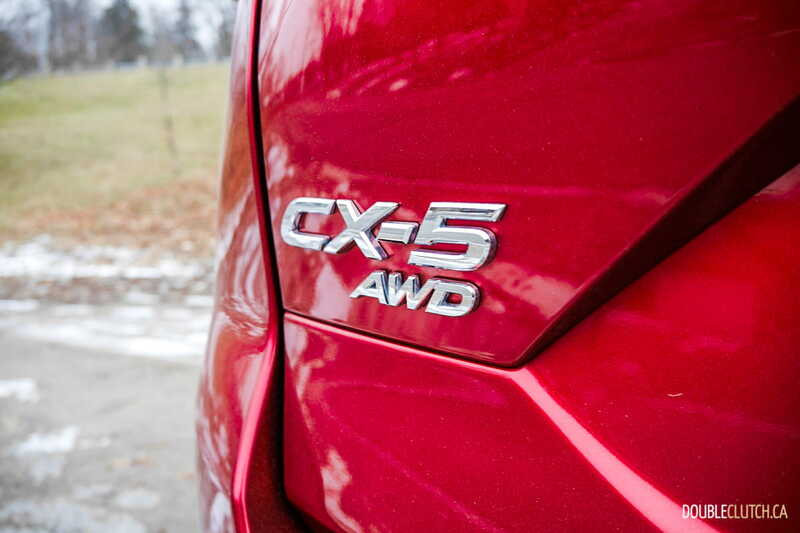 This allows the CX-5 Signature to be the most powerful CUV in its class, and even punch a weight class above against some entry level luxury crossovers and SUVs. 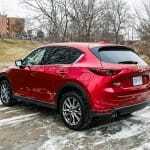 Mazda does not have a luxury brand like Honda, Nissan, and Toyota do. 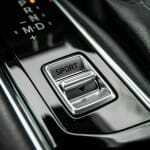 They instead try and compete for a piece of the pie in the entry luxury segment by stuffing their top of the line Signature trim level with features and materials not typically found in other mainstream offerings. 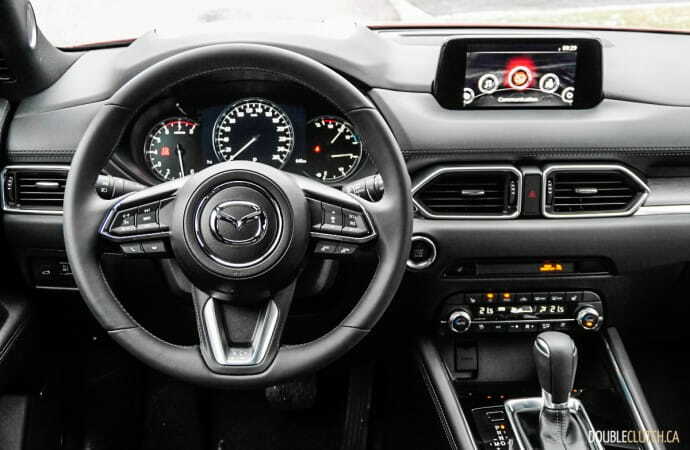 The 2019 Mazda CX-5 Signature is no different here; other than the upgraded turbocharged powerplant, Mazda has further equipped it with features such as ventilated front seats, power-folding mirrors, auto-dimming rearview frameless mirror with HomeLink, and Cocoa Nappa leather-trimmed seats. 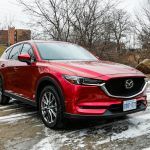 Our theory is that the new CX-5 Signature, with an all-inclusive MSRP of $40,950, can be a sneaky competitor against some entry level luxury compact crossovers such as the Cadillac XT4 Luxury, Infiniti QX30(reviewed here), and the all-new Lexus UX. 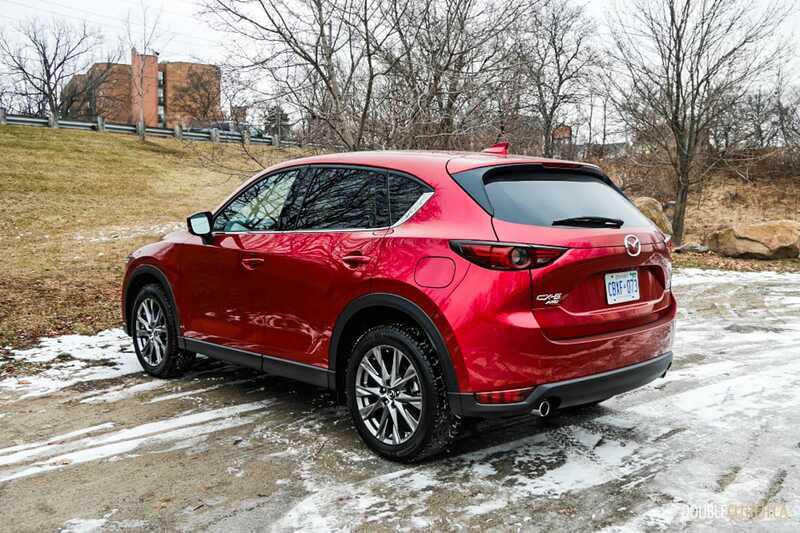 Our tester arrived in the office painted in a beautiful Soul Red Crystal Metallic paint, a colour that is well worth the $450 premium and is quickly becoming Mazda’s signature colour. 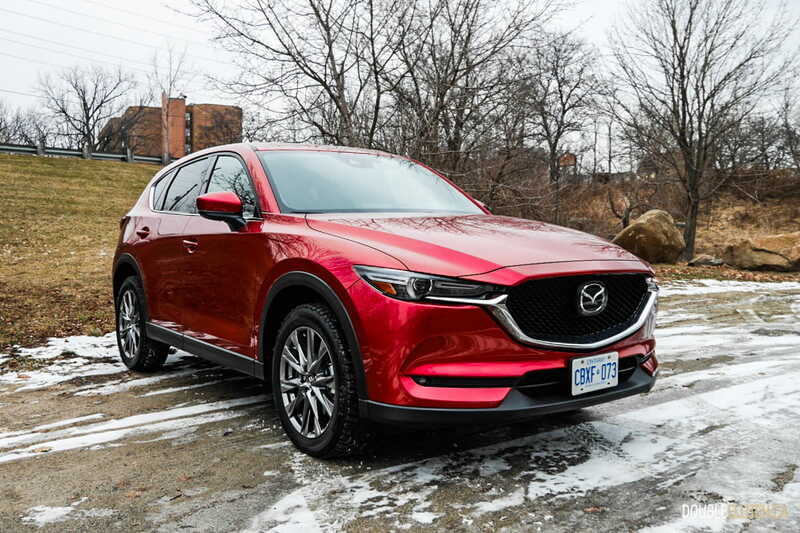 The CX-5 was redesigned in 2017, carrying on Mazda’s KODO design ethos. 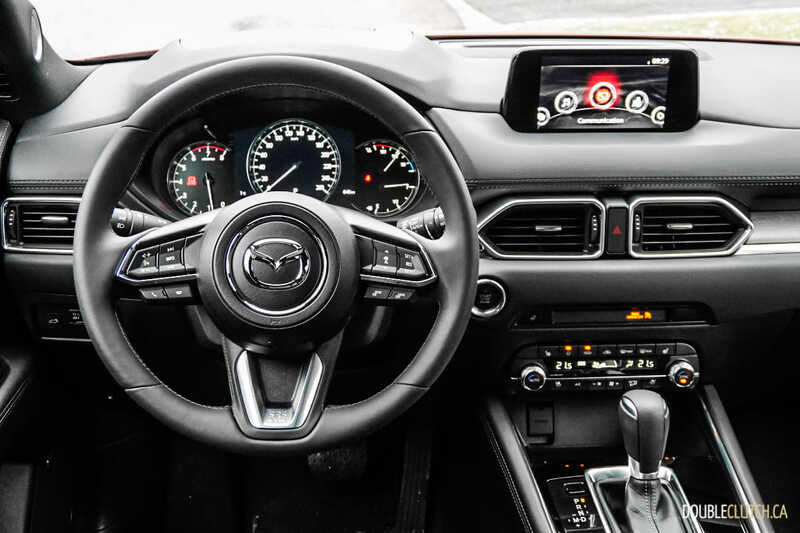 Looking from the front, the Signature features Mazda’s signature fascia, and full LED lighting gives it a striking and sophisticated appearance. 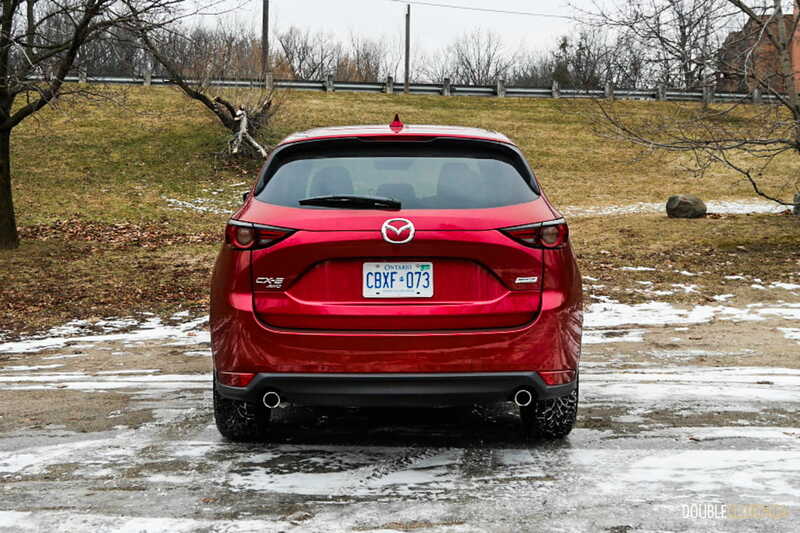 A walk around the CX-5 will reveal the fastback-esque design with a sloping hatch design and a rear end that shares resemblance with the sporty Mazda3 (reviewed here). It’s an attractive car that stands out in a parking lot full of of mediocrity. 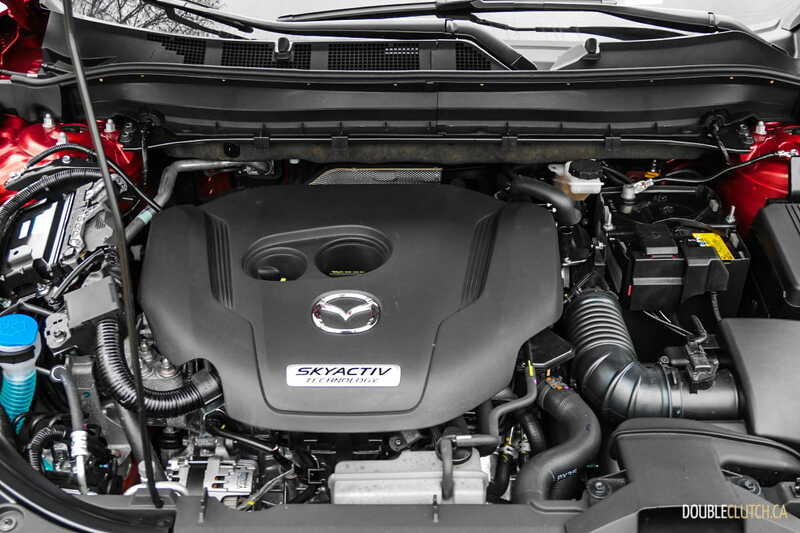 The CX-5 Signature’s upgraded 2.5-litre SKYACTIV-G turbocharged engine and the SKYACTIV-Driver six-speed automatic transmission are borrowed from its older brothers, the Mazda6 (reviewed here) and CX-9 (reviewed here). 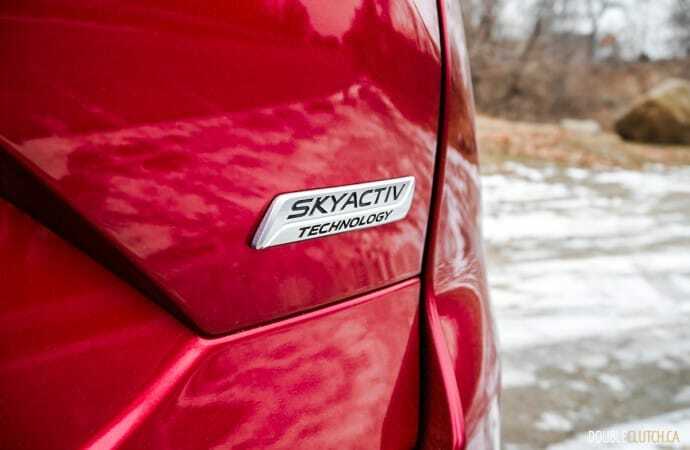 On paper, the turbocharged engine’s rated 250hp (with 93-octane fuel) and 310 lb-ft. of torque are numbers more powerful than any CUV rivals, and output is respectable even if you compare to premium offerings. 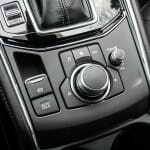 Unfortunately, the transmission’s gear ratios are awkward, and the CX-5 struggles to put usable power down on real road testing. 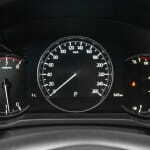 To get moving from a standstill requires patience while the RPMs slowly build up. 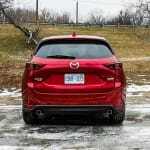 This made the CX-5 feel slower than one would expect given its power figures. 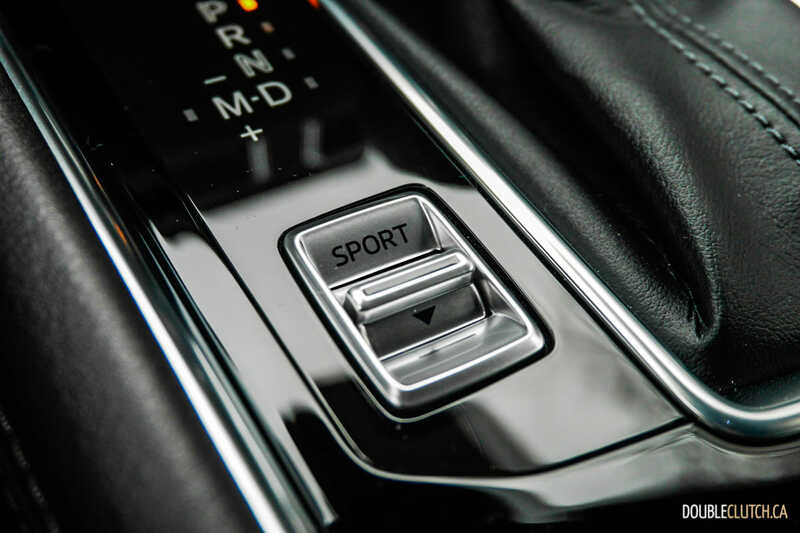 The Signature offers a Sport driving mode, which sharpens up engine response. 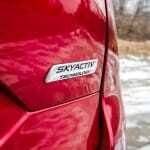 However, overall powertrain tuning makes for an unrefined driving experience. 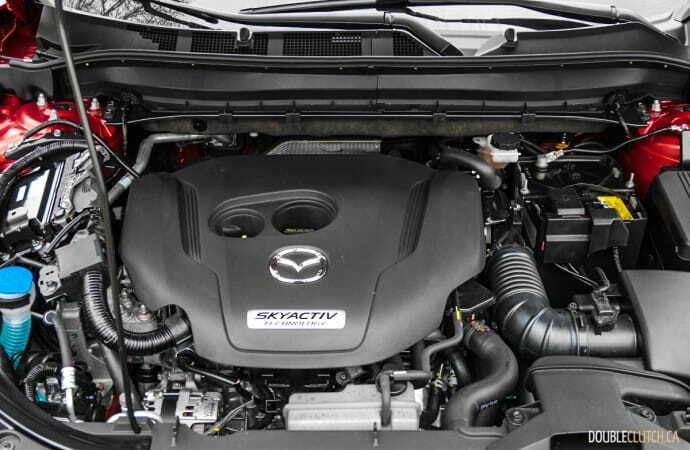 Even though the CX-5 Signature’s engine is a bit of a letdown, it makes up for it in the handling department. 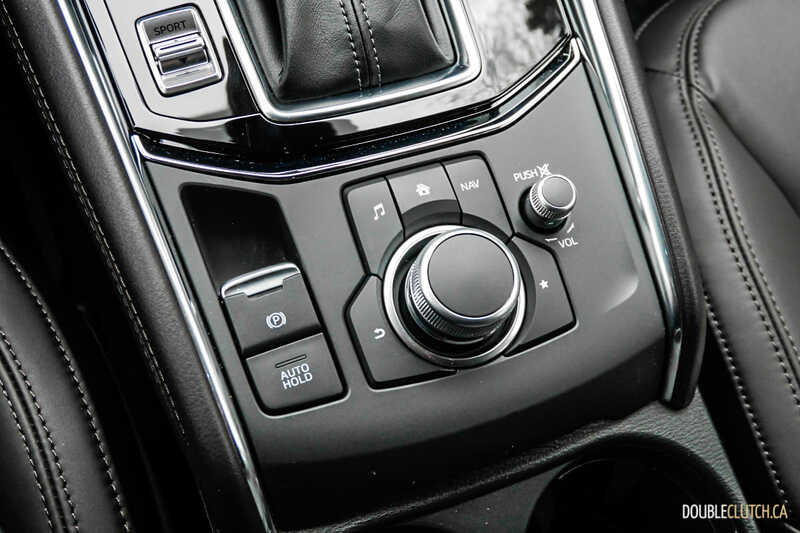 The 2019 Mazda CX-5 has added G-Vectoring Control Plus (GVC Plus) system across all trim levels. This aims to improve cornering stability by using small changes in engine output to shift weight and help improve the overall response. During our road test, we observed precise steering response with excellent on-center feel. 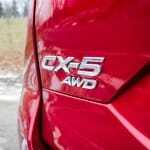 The CX-5 remains one of the better handling examples in the CUV segment. 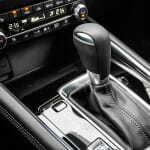 The reason automakers design cars with taller gearing ratios is to make for lower RPMs at higher cruising speeds, ultimately for better fuel economy. 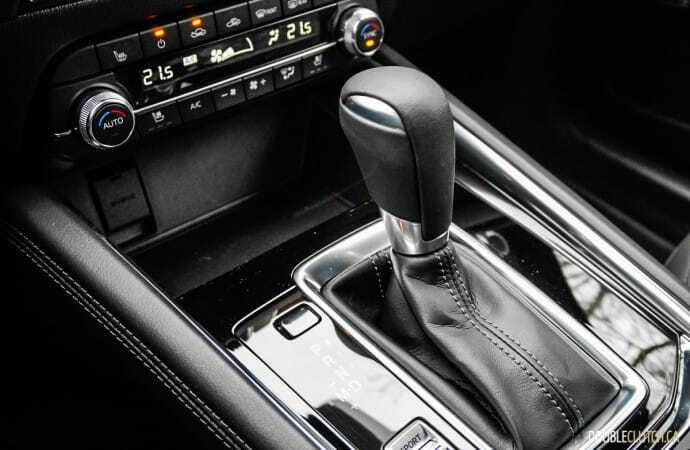 Even though the CX-5 Signature only has six gears, it manages to stay below 2,000RPM while cruising at 100km/h, a benchmark that is appreciated. 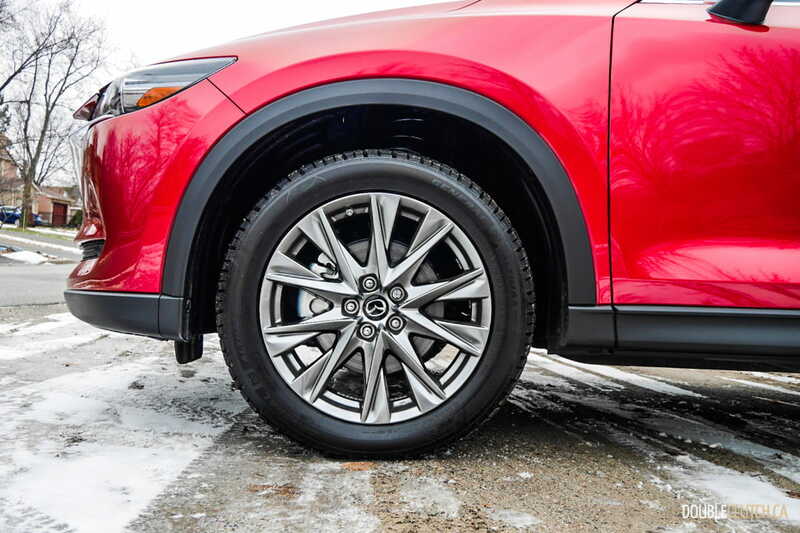 It’s rated at 10.8L/100km city and 8.7L/100km highway, and we observed a higher than rated 12.3L/100km on winter tires during a cold spell. 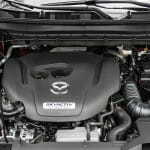 The CX-5 Signature will accept 58L of fuel, and it requires a minimum of regular grade gasoline if drivers will accept a lower 227 hp power output. 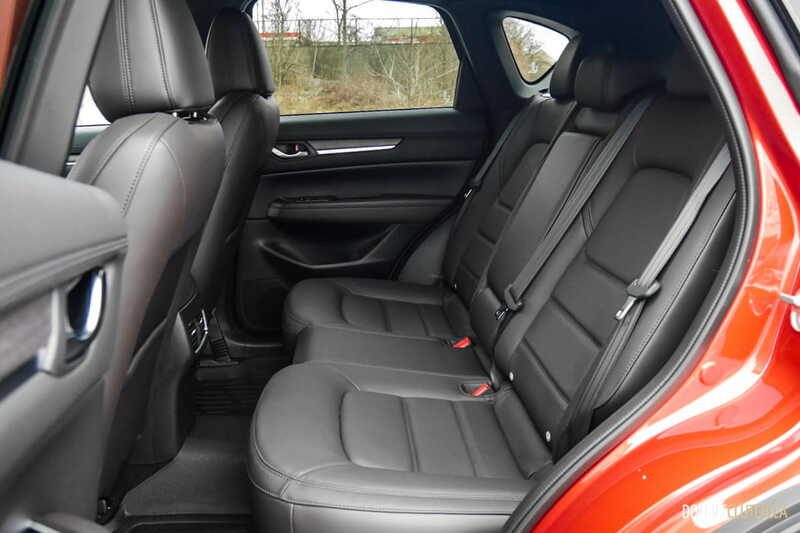 Fortunately, treading through the brutal cold in the CX-5 Signature is an enjoyable endeavour given the well-appointed interior and comfort. 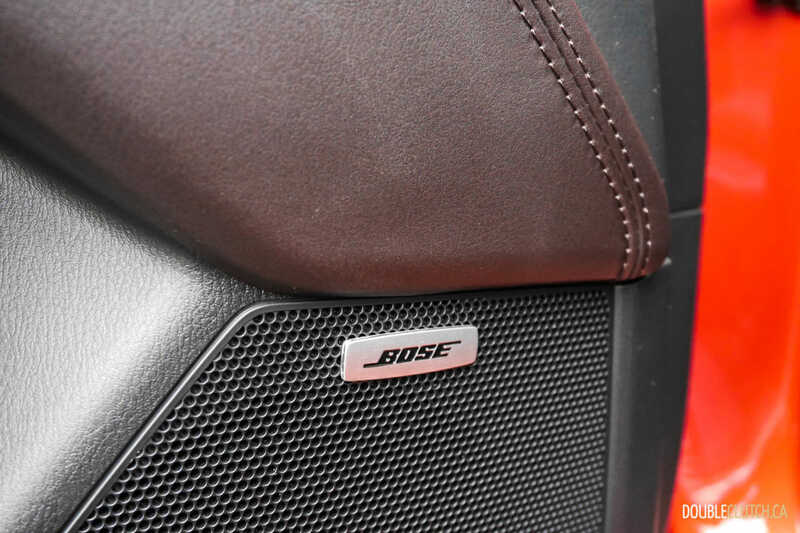 The Nappa leather wrapped front seats are supportive with decent thigh support for longer drives, and the Abachi wood trimmed panels, LED lighting, and satin chrome-plated power seat switches and glovebox lever create an upscale and luxurious atmosphere. 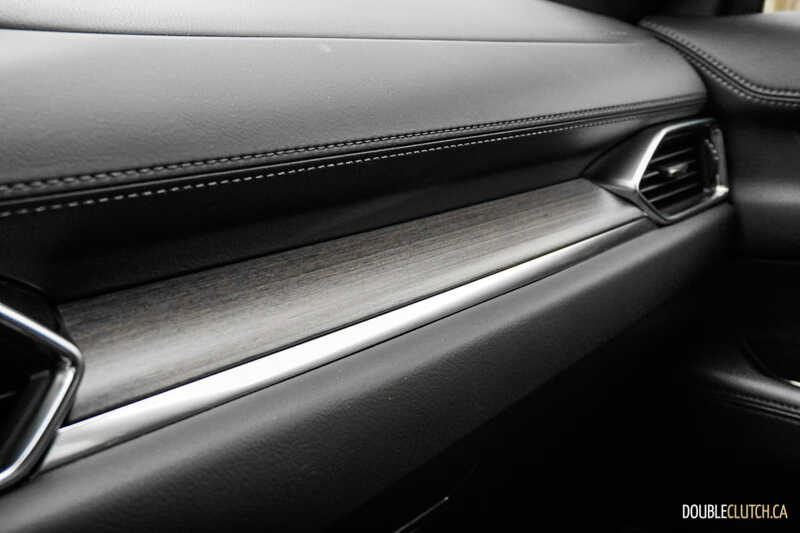 Materials are soft to touch and feel more premium than most other offerings in the price range. 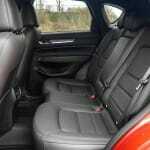 We would have liked to see heated rear seats included but overall, the CX-5 is nicely equipped for its price. 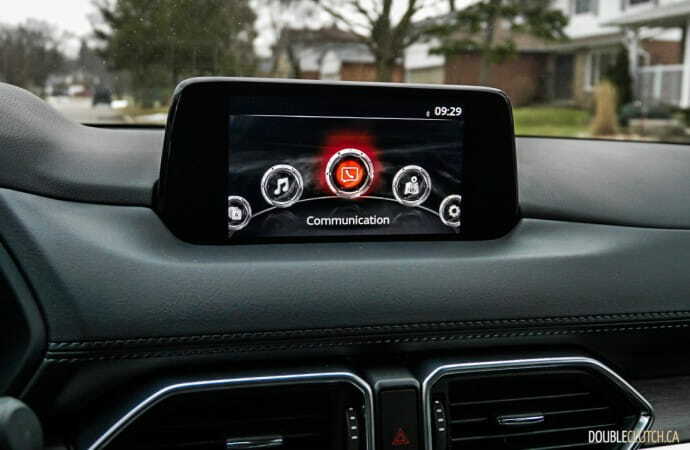 One of the more exciting news from Mazda Canada this year is that they have decided to equip their entire 2019 model lineup with Apple CarPlay and Android Auto connectivity, and are offering a retrofit option for an expansive list of older models dating as far back as the 2014. This news is very much welcomed in today’s day and age where distracted driving is becoming a pandemic. 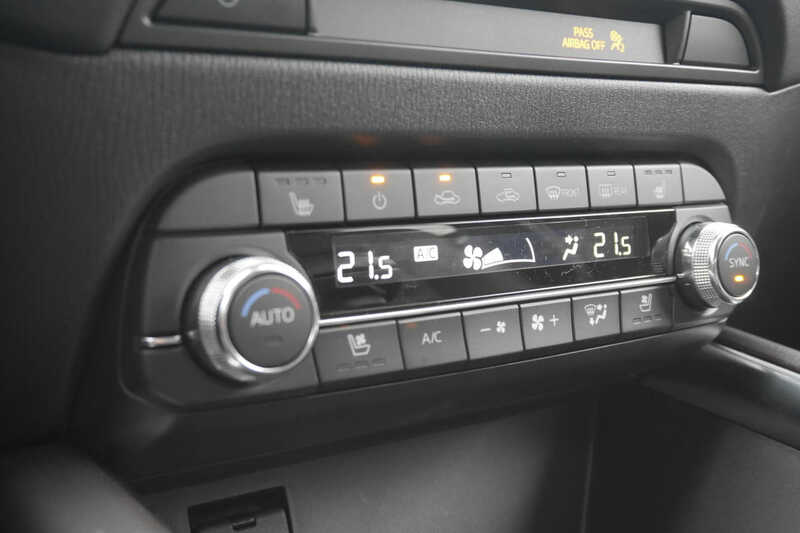 The CX-5 Signature’s infotainment is controlled using the seven-inch touchscreen display that can also accept commands using rotary dials. 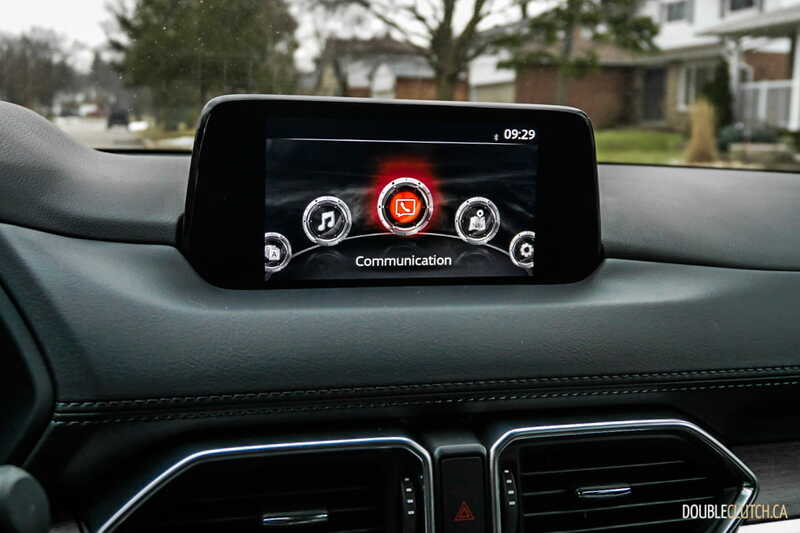 System navigation is intuitive but accessing some of the commonly used features such as CarPlay/Android Auto and audio source require a bit of digging within menus from the home screen. 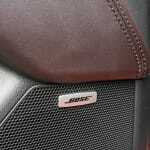 Sound quality is excellent with Bose 10-speaker sound system that is standard on the GT trim and above. Our tester is equipped with windshield-projected Active Driving Display (heads-up display), a clever system that displays upcoming stop signs and blind spot warnings on the windshield to alert drivers. 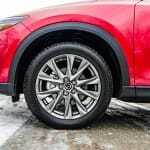 Mazda has put an emphasis on enhancing proactive safety in its vehicles, and the CX-5 Signature is equipped with the latest i-ACTIVSENSE safety system. 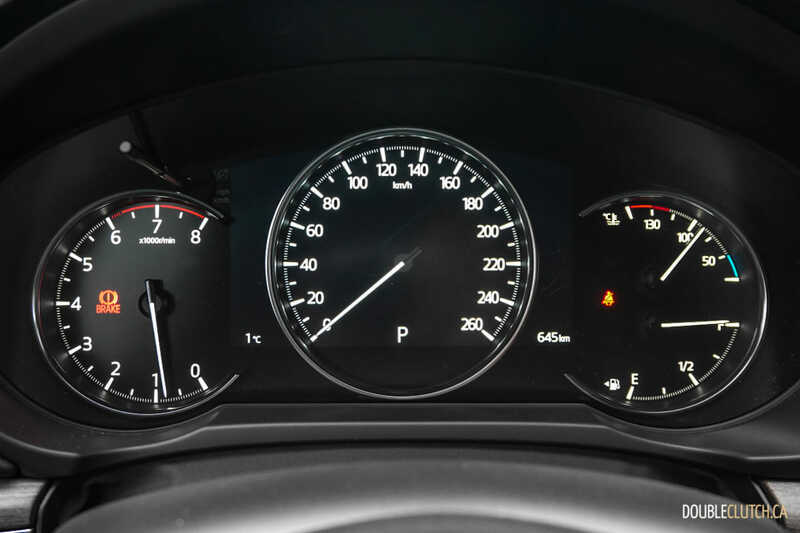 This includes a full suite of features such as Smart City Brake Support, Blind Spot Monitoring, Rear Cross-Traffic Alert, Adaptive Front-lighting, Distance Recognition Support and Forward Obstruction Warning, Lane Departure Warning with Lane-Keep Assist, Radar Cruise Control with Stop and Go function. Adding to this, it also offers second row passenger detection and seat belt reminder systems. The 2019 Mazda CX-5 Signature presents an interesting choice for car buyers. 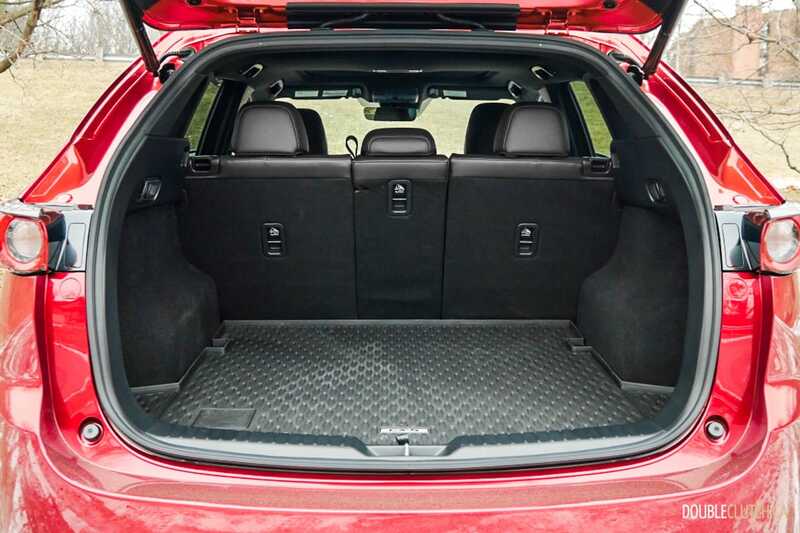 It is more powerful and offers better handling than other top of line CUVs such as the Subaru Forester Premier (reviewed here), Toyota RAV4 Limited, and the Honda CR-V Touring. 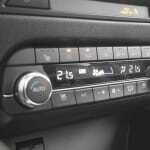 Despite disappointing power delivery, it is still a top choice for drivers who care about the joy of driving. 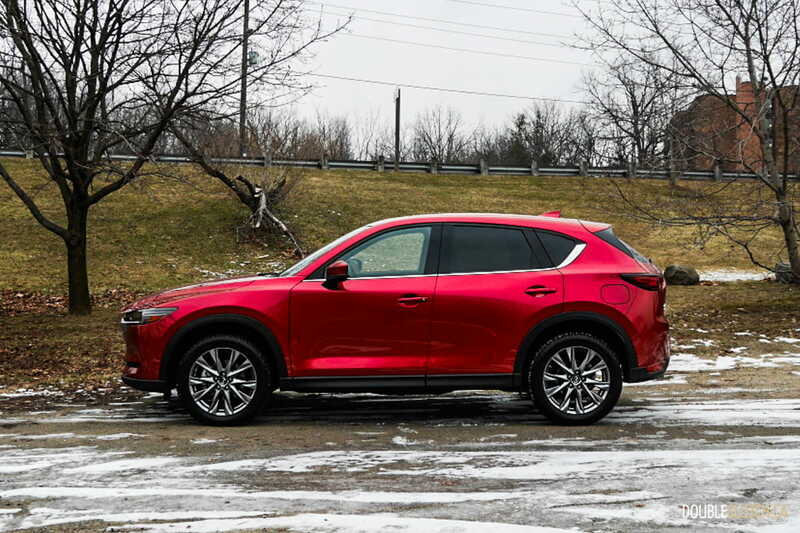 Buyers shopping for a entry-level luxury crossover should also give the CX-5 Signature serious consideration, as it offers a driving experience on par with those in the segment.